← My marathon blog – no funny business…. I have run the London Marathon and I loved it! If you have a hankering then you should certainly do it – honestly it was great fun – mainly. OK do you want the blow by blow? Got a couple of hours? Ha ha no I would not do that to you but I will do a few bullet points just so I don’t forget what an amazing day I had. 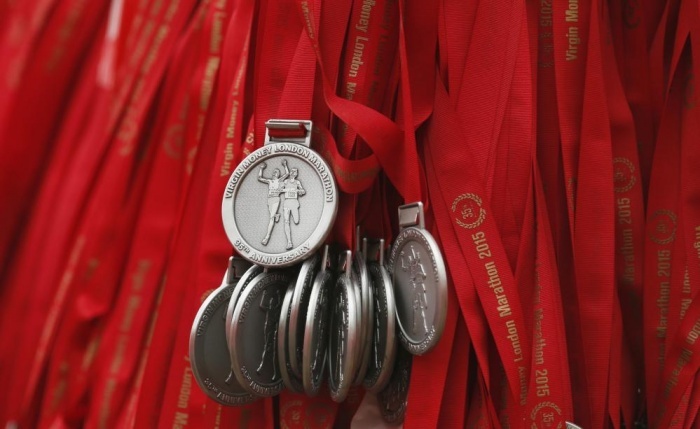 Here is what I have learned about running the London Marathon. Walking within a huge crowd to the beat of a drum towards your inevitable fate feels like being a tribute in the Hunger Games – you will feel sick. Seeing people you know, loved ones, other runners – it is fabulous – don’t underestimate your role as a supporter. The crowd noise coming up to Tower Bridge gives you a glimpse into the world of the Roman gladiators – addictive – until you get killed obviously. Running away from Central London towards the Isle of Dogs isn’t as bad as you think. Canary Wharf is mobbed! And where did all those buildings come from – it’s like the opening credits of Dallas down there. At 19 miles this marathon lark feels very do-able – almost routine – easy innit? At mile 20 – Hmm goes on a bit doesn’t it? In the Blackfriars Tunnel Taylor Swift is Shaking it Off – good for her. London’s landmarks are laid out before you – The Wheel, Big Ben – you don’t give a stuff. Birdcage Walk – the severe pain that has appeared in your buttock starts to move into your lower back – baby will soon be here. Turning the corner into the Mall everything falls away and you peg it to the end – hurray! You are met in your hour of triumph by no one in particular. So there it is. Just a few thanks – to my long suffering family who put up with the whole thing and didn’t steal my beetroot juice – to boot camp Annie who understood that you MUST strength train to complete a marathon – to everyone who donated to CRY and the Tom and Claire fund – you raised nearly a thousand pounds which is simply stunning!!!!!!! It really is a great day out if you fancy it? Annie here! Just noodled along to your blog and indulged myself in some marathon prep reading…it has encouraged me to get out there again. Too long away from the pavements. I could even feel the anxiety of pre-run nerves. Safe in knowledge I will not do another London, I could enjoy nodding in recognition. Right. Up and at ’em!